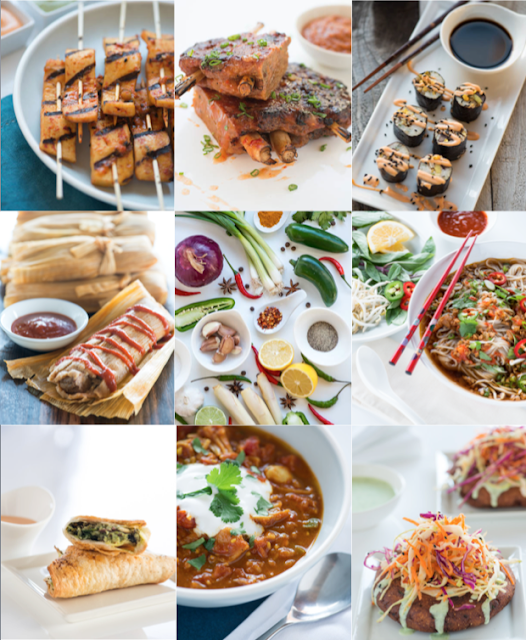 A sampling of Wade's beautiful photos from the upcoming Fusion Food in the Vegan Kitchen. From top left Spicy Korean BBQ Tofu Satay, Hot, Sweet and Sour Seitan Ribs with Lemongrass Bones, Jalapeno and Chimmi Corn Sushi Rolls, The International Fair of Tamales, a variety of fusion ingredients, Sloppy Joe Pho, Peruvian Aji Verde Potato Samosas, Indian Spiced Pumpkin and Jackfruit Chili, Pupusas Gorda topped with Creamy Cilantro Pepita Pesto Sauce and Sesame Carrot Coleslaw. Guess what? Fusion Food in the Vegan Kitchen is now available for preorder! I am so excited about it, too. What makes this book so different than anything I've ever done before? "This innovative vegan cookbook combines the best of both worlds—comfort food + ethnic cuisine. The result is Fusion Food in the Vegan Kitchen, a delicious, experimental type of cooking popular in California and quickly taking the vegan world by storm. Its focus is not only on fresh, local ingredients, but also the amazing flavors found in different world cuisines. Think Korean pulled “pork” sandwiches, miso mac ’n’ cheese, and Mexican hot chocolate cake truffles. Traditional, with a twist! Author and California native Joni Marie Newman will treat you to more than 100 innovative recipes, all featuring whole foods ingredients that can be found at almost any grocery store or farmer's market—no store-bought faux meats, mayos, cheeses, or the like. Recipes will also feature low fat, soy free, and gluten free options for those with special dietary needs. Push the envelope on taste and take plant-based cooking to a whole new level with Fusion Food in the Vegan Kitchen." It has been so much fun writing and testing for this book. And it was (and still is) a big pleasure to be working with Wade Hammond on the photography. His modern take on food photography and styling really captured the true essence of these recipes. 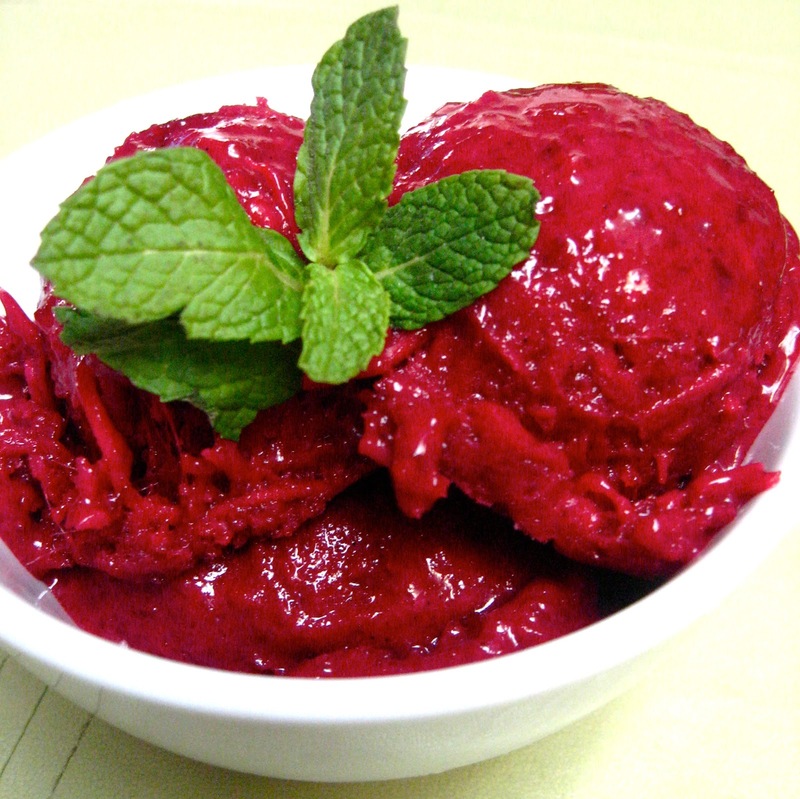 To get you as excited about this as I am, I thought I'd share a recipe that is perfect for Spring... Coconut Ginger Beet Ice Cream! This bright pink ice cream gets its color from the beets and has a little bite from the ginger. Add water, beets, and ginger to a blender and puree until smooth. Add pureed mixture to a saucepan, along with the coconut milk, sugar, cornstarch and the scrapings from the vanilla bean. Stir to combine. As soon as it begins to boil, remove from heat and stir in vanilla extract, shredded coconut, and lemon juice. Although we all scream for ice cream, we also know that not everyone has access to an ice cream maker. Here are some simple instructions (although a bit more laborious) to make delicious homemade ice cream without one. The purpose of an ice cream maker is to aerate the ice cream and prevent it from becoming too crystallized as it freezes. This can be accomplished with an electric mixer, as long as you have a few hours to spend. Don't worry. Most of that time is down time. After following the recipe up to the point where it tells you to follow the directions on your ice cream maker, follow these simple steps. Pour the ice cream mixture into a mixing bowl and chill in the refrigerator for two hours, then place it in the freezer for about a half hour. Remove it from the freezer and beat with a mixer until creamy. Put back into the freezer for another half hour. Repeat this process three times before placing it in the freezer for the final freeze. Usually overnight, for a nice, hard, firm ice cream. So awesome! I'm super excited for this book already, Joni :) Congrats! Yay! I am looking forward to this book! Can't wait for the book to come out! It was such a thrill testing for you, Joni! Worldwide Vegan Bakesale: OC Represents!